note: 180g heavy vinyl edition. 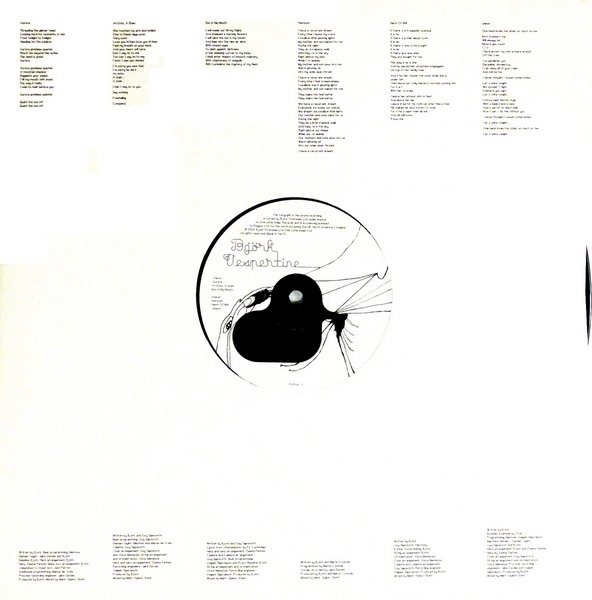 mispressing: sides c and d contain the tracks of sides a and b.
note: regular weight vinyl re-release. 'dmm' in the matrix. 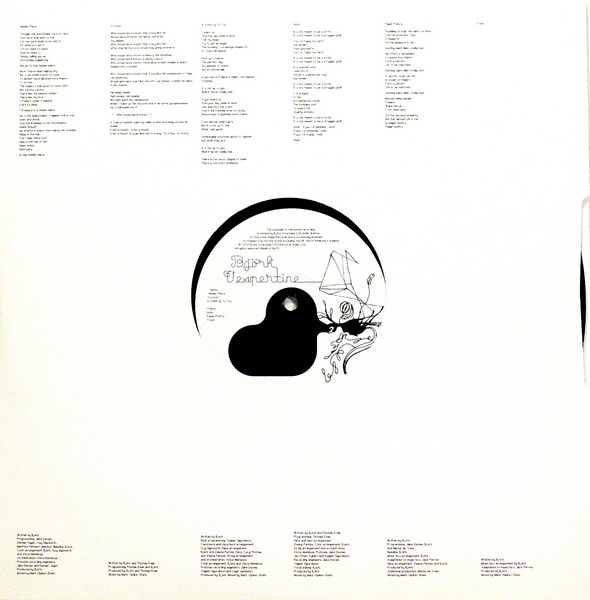 note: 140g white coloured vinyl edition. limited to 5000 copies. note: comes with lyrics sheet and cardboard sleeve that holds the cd. note: cd side: standard audio version. dvd side: audio remixed in 5:1 dolby digital and 5:1 dts. comes with the videos of hidden place, pagan poetry, cocoon, it's in our hands and nature is ancient. 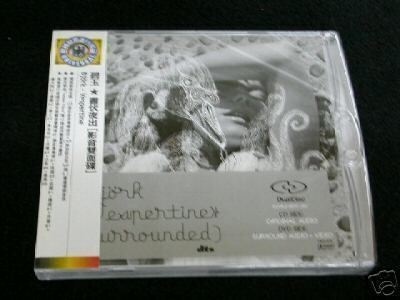 note: contains 12 cds delivered in cardboard sleeves each holding one track of vespertine in the above mentioned order. the sleeves are identical to the copies given out in dazed & confused magazine 80, august 2001, but the cds are different for the labels show the track of each cd and the cat.no (olicd1 - olicd12). note: 180g heavy vinyl edition. contains 2x12inch records in two separate plain white paper sleeves. these sleeves are held together with a sticker from securicor omega. note: came with issue august 18, 2001 of "the times". track 9 live at the union chapel accompanied by the brodski quartet. enhanced multimedia cd: features mac and pc compatible videofiles of hidden place, hunter, all is full of love and hyperballad plus exclusive audio snippets from vespertime, björk - the book, a photo gallery, biography, wallpaper and screen savers. note: came with issue 80, august 2001 of "dazed & confused". each cardboard sleeve has the same back and holds a random 1-track cd. there are twelve different cds around containing one of the above mentioned tracks. you can tell which cd you are getting if you look at the name (cat.no) of the cd. the names are: an echo, a stain: numinous, aurora: spittoony, cocoon: unions, frosti: homelier, harm of will: rarau, heirloom: airflow, hidden place: dunno, it's not up to you: fortis, pagan poetry: helipad, sun in my mouth: nocontest, undo: hatsonanacre, unison: patronage. note: track 2 has later been released as cocoon. note: contains album versions and unedited demo versions. track 1 is the the album version, slightly different. tracks 6, 7 and 8 are instrumental versions with choirs, party different from the album versions' choir. note: track 8 has later been released as an echo, a stain. note: track 6 has later been released as pagan poetry, track 8 has later been released as cocoon, track 11 has later been released as an echo, a stain, track 14 has later been released as generous palmstroke, track 15 has later been released as heirloom, track 16 has later been released as ??. 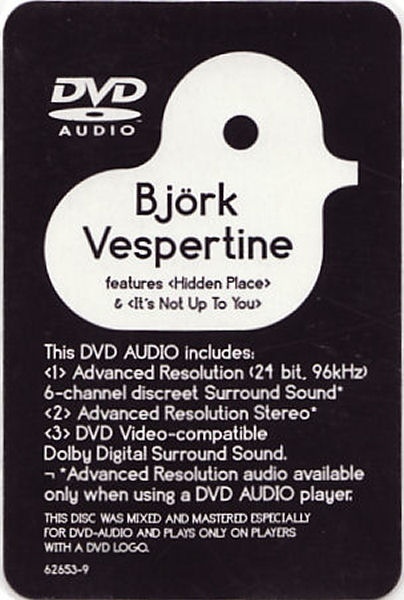 note: short clips of hidden place with sound effects that were put online at bjork.com as "internet postcards" and seem to be the source for lots of video captures (e.g. desktop pictures at elektra.com etc). the longest one is about 10 seconds long, and each clip is interspersed with one minute of black screen. note: version 1. white 12x9inch box set with swan title sticker. includes tplp101cdp, hidden place promo video, three page biography, colour photo, sticker, large t-shirt with print on both sides and "with compliments"-slip. note: version 2. white 12x9inch box set with swan title sticker. includes tplp101cdp, 332tp7cd, hidden place promo video cassette, one page press info, three page biography, colour photo, sticker, large t-shirt with print on both sides and "with compliments"-slip. note: version 3. white 12x9inch box set with swan title sticker. includes uk cdr promo (12 track), artwork slide, one page press info, three page biography and "with compliments"-slip that has one little indian stickers on. 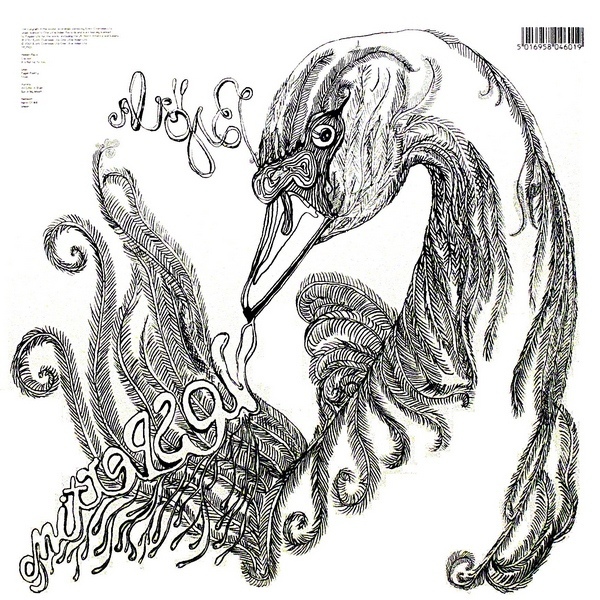 note: misprint on cdr label: "coccoon". 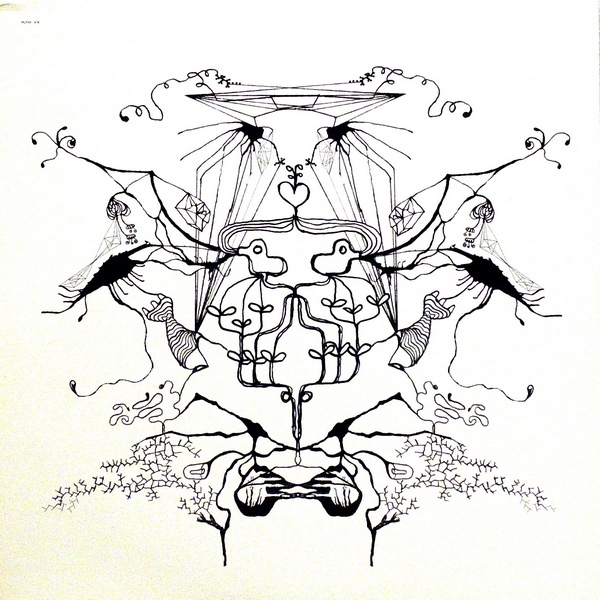 track 8 has later been released as an echo, a stain. note: a4 transparent white pvc flip-top folder. 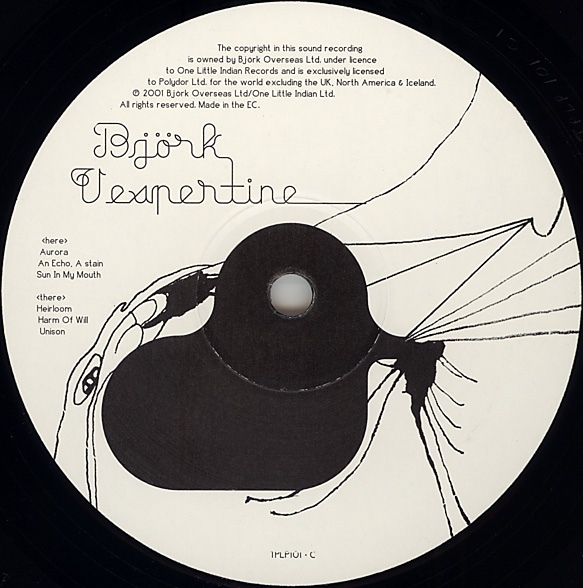 contains vesp1 (australia), vespertine australia cdr promo, 50x sheets of 'björk-vespertine' note paper with swan image watermark, 20x 'björk' printed envelopes. note: the last picture of the booklet is printed upside down. note: 180g heavy vinyl edition. 589000-1 is the catalogue number for the whole set, the records are 589239-1 and 589 240-1.
note: cd presented in mini lp-style card sleeve with mini replica inner sleeve, japanese/english lyrics booklet, insert and obi strip, housed in 'original editions vintage vinyl replica' stickered pvc wallet. "generous palmstroke" is mentioned in the tracklist but not present on the cd. note: track 2 has been later released as cocoon. note: misprint on front: "coccoon". 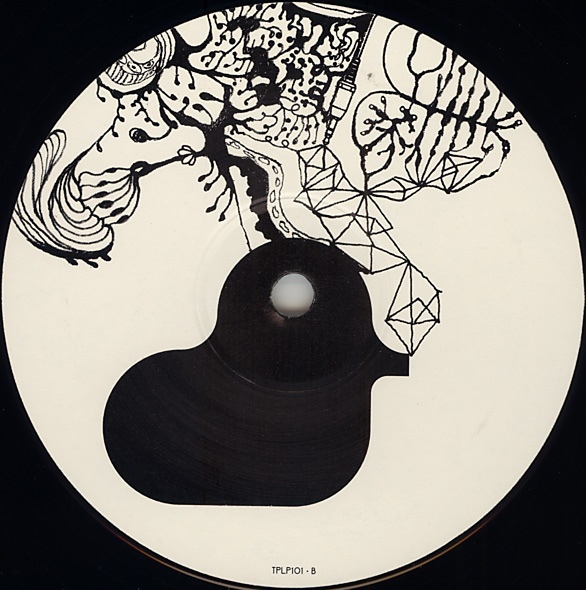 track 8 has later been released as an echo, a stain. 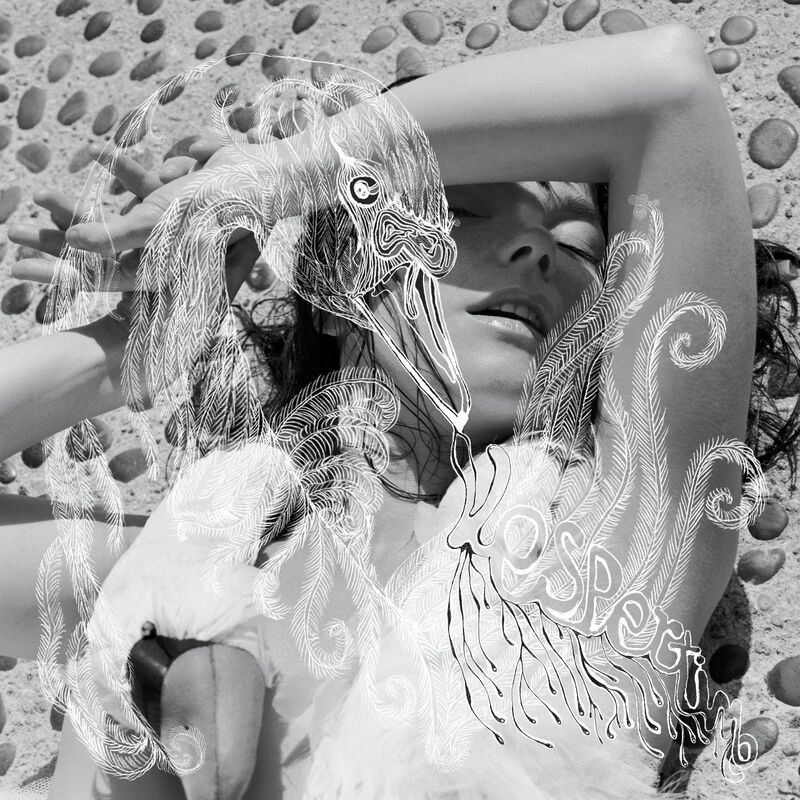 note: official promo cdr of the paris press conference held to launch vespertine. 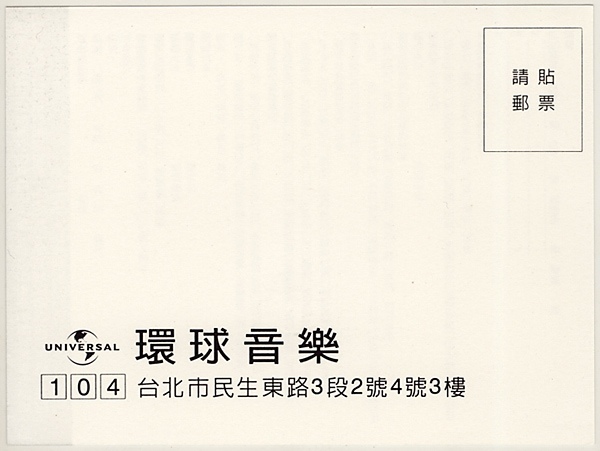 note: tplp101cdl with polydor sticker on the barcode. contains lyrics booklet and cardboard sleeve that holds the france-only cd. note: came with issue 300, august 2001 of "les inrockuptibles". each cardboard sleeve has the same front and back and holds a random 1-track cd. the catalogue numbers are bjorkcd1 to bjorkcd12 in above mentioned order. note: wrong tracklisting on front. 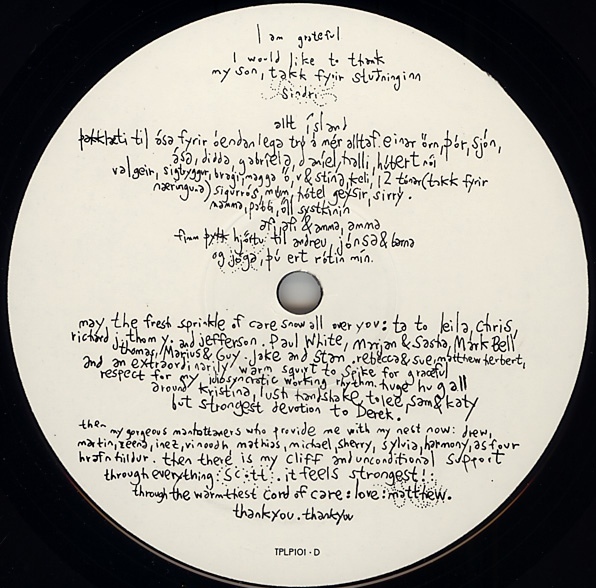 misprint on cdr label: "arm of will". 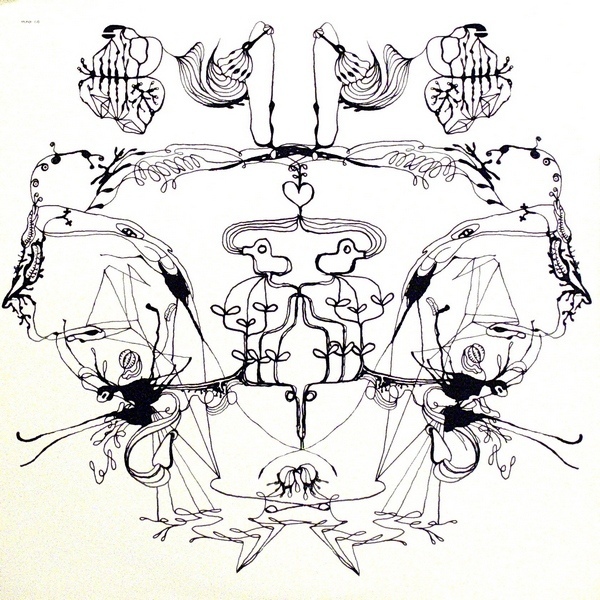 track 4 has later been released as an echo, a stain. note: contains five screensavers, one for each björk album. issued by fnac stores france when one bought more than one björk albums. note: 6x5x1,5inch box set with wrap-around tape. 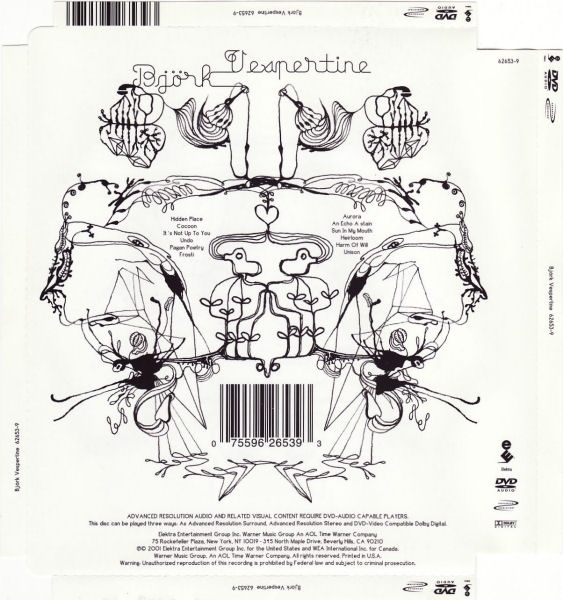 contains all 12 cds (bjorkcd1 - bjorkcd12) issued with the "les inrockuptibles" magazine. note: 6x5x1,5inch box set with front sticker. 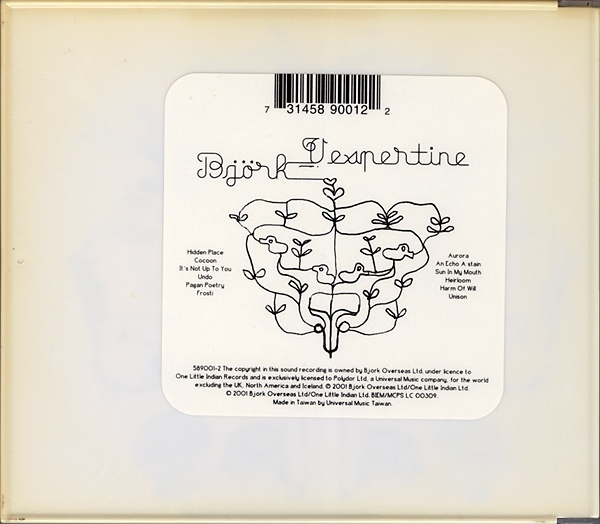 contains all 12 cds (bjorkcd1 - bjorkcd12) issued with the "les inrockuptibles" magazine. note: press kit together with 8364. opens out to reveal biography, press information and concert dates for france (august only). note: 589000-2 (europe) with info sticker. note: may include a three-page press release. track 2 has been later released as cocoon. 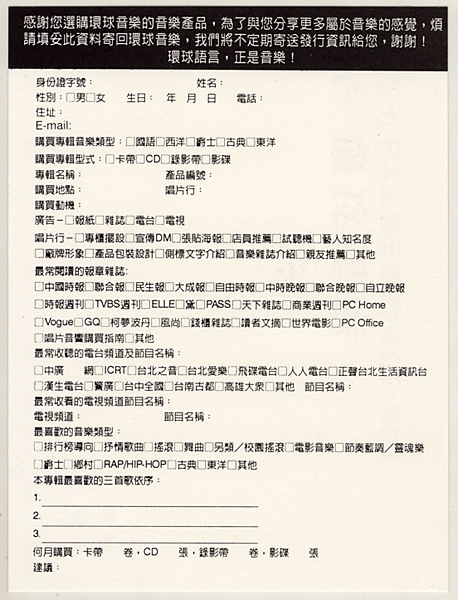 note: 589000-1 with info sticker and lyrics sheet. note: re-release in 'super nice price 1470' series. note: re-release in 'my generation, my music' series. note: re-release in 'ultra price' series. note: promo sticker on barcode and sample reference at the centre of the cd. comes with cd-size promo sticker and 12-page lyrics booklet. note: booklet includes biography, discography, videography, photos, information about björk collaborators and statements of björk. comes with universal infosheet. track 7 is also known as hyperballad. note: press kit together with sic-1042. 8.5x6inch stapled booklet. 12 pages (including covers as pages). 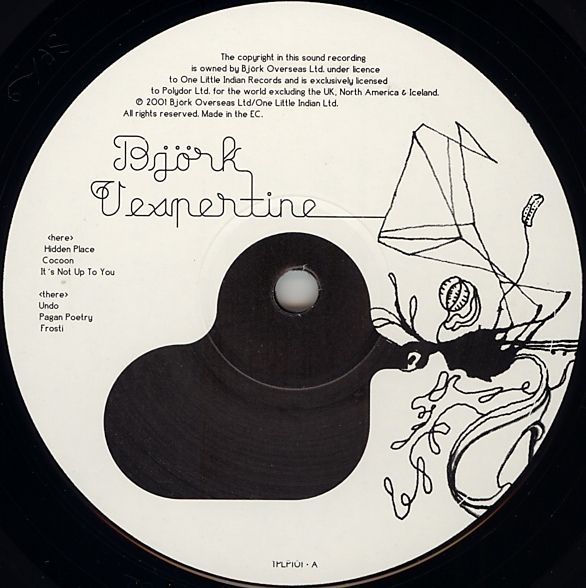 page 1 front cover, page 2-3 picture of björk in water in red shoes, page 4-5 björk career timeline from 1965 to August 2001, page 6-7 vespertine article page 8-9 dancer in the dark article page 10-11 text and photos, page 12 discography back. note: press kit together with sic-1042. 8.5x8.5 foldout leaflet, folded in half. note: front logo is not a sticker, but printed. note: the title on cassette is printed in straight font. front round logo is not a sticker, but printed. note: the title on cassette is printed in italic font. front round logo is not a sticker, but printed. note: catalogue number on front sticker: 589000-4. sample reference at the centre of the cd. note: sample reference around the disc centre. note: back insert only. sleeve with catalogue number 2a-62653, disc with catalogue number 62653-2a. note: cdr without cat.no, but comes in sleeve of 2a-62653/62653-2a. track 1 without choir, track 5 voice and bass only, no choir, tracks 6 and 7 don't fade into each other. note: contains biographies, logos, photos and the video of hidden place.